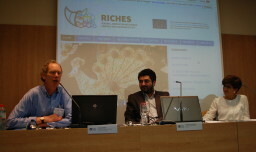 On 13th May i2CAT Foundation, in collaboration with the Universitat Internacional de Catalunya (UIC), organised the first RICHES activity in Barcelona. The workshop brought together representatives of the RICHES project, academics and students from the UIC, representatives of the Network of Common Interest affiliated in the project and several external experts including Dr. Diane Dodd from IGCAT. This activity focused on building the project’s foundation and establishing an initial agreement of basic definitions and frameworks which will delineate RICHES’ fields of research and further study on the context of change and the role of Cultural Heritage (CH) in the economic and social development in Europe. More than 50 participants had registered to be part in the several discussion sessions proposed in the workshop’s programme in order to discuss the taxonomy that will represent the common ground of understanding and research of the project. Although it is impossible to capture the full extent of discussions and perspectives, all the Workshop’s presentations and discussions served to analyse in depth all the topics that RICHES is addressing and proved to be extremely insightful and beneficial both to the attendees and the project’s representatives and researchers.